This article is about the orbiter launched in 1988. For the Soviet/Russian reusable space program, see Buran programme. Buran (Russian: Бура́н, IPA: [bʊˈran], meaning "Snowstorm" or "Blizzard"; GRAU index serial number: "11F35 K1") was the first spaceplane to be produced as part of the Soviet/Russian Buran programme. It is, depending on the source, also known as "OK-1K1", "Orbiter K1", "OK 1.01" or "Shuttle 1.01". Besides describing the first operational Soviet/Russian shuttle orbiter, "Buran" was also the designation for the whole Soviet/Russian spaceplane project and its orbiters, which were known as "Buran-class spaceplanes". OK-1K1 completed one unmanned spaceflight in 1988, and was destroyed in 2002 when the hangar it was stored in collapsed. It remains the only Soviet reusable spacecraft to be launched into space. The Buran-class orbiters used the expendable Energia rocket, a class of super heavy-lift launch vehicle. The construction of the Buran-class space shuttle orbiters began in 1980, and by 1984 the first full-scale orbiter was rolled out. Construction of a second orbiter (OK-1K2, informally known as Ptichka) started in 1988. The Buran programme ended in 1993. The only orbital launch of a Buran-class orbiter occurred at 03:00:02 UTC on 15 November 1988 from Baikonur Cosmodrome launch pad 110/37. Buran was lifted into space, on an unmanned mission, by the specially designed Energia rocket. The automated launch sequence performed as specified, and the Energia rocket lifted the vehicle into a temporary orbit before the orbiter separated as programmed. After boosting itself to a higher orbit and completing two orbits around the Earth, the ODU (Russian: объединённая двигательная установка, сombined propulsion system) engines fired automatically to begin the descent into the atmosphere, return to the launch site, and horizontal landing on a runway. After making an automated approach to Site 251 (known as Yubileyniy Airfield), Buran touched down under its own control at 06:24:42 UTC and came to a stop at 06:25:24, 206 minutes after launch. Despite a lateral wind speed of 61.2 kilometres per hour (38.0 mph), Buran landed only 3 metres (9.8 ft) laterally and 10 metres (33 ft) longitudinally from the target mark. It was the first space shuttle to perform an unmanned flight, including landing in fully automatic mode. 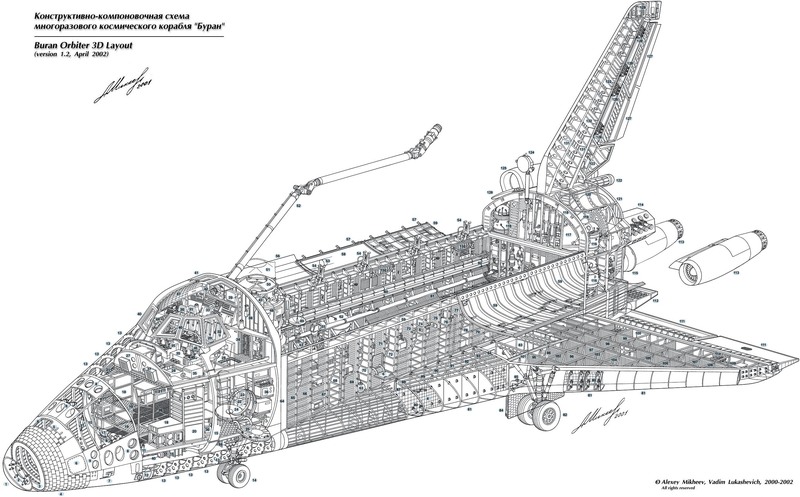 It was later found that Buran had lost only eight of its 38,000 thermal tiles over the course of its flight. In 1989, it was projected that OK-1K1 would have an unmanned second flight by 1993, with a duration of 15–20 days. Although the Buran programme was never officially cancelled, the dissolution of the Soviet Union led to funding drying up and this never took place. In June 1989, Buran, carried on the back of the Antonov An-225, took part in the 1989 Paris Air Show. In 1990, it also appeared at the Farnborough Airshow. Another flight of the spacecraft did not occur as, together with the Energia carrier, it was later put in a hangar at the Baikonur Cosmodrome, Kazakhstan. On 12 May 2002, during a severe storm at the Baikonur Cosmodrome in Kazakhstan, the MIK 112 hangar housing OK-1K1 collapsed as a result of poor maintenance. The collapse killed several workers and destroyed the craft as well as the Energia carrier rocket. ^ a b c d e f "Buran". NASA. 12 November 1997. Archived from the original on 4 August 2006. Retrieved 15 August 2006. ^ "Eight feared dead in Baikonur hangar collapse". Spaceflight Now. 16 May 2002. ^ a b c d "Buran". Russian Space Web. 15 October 2012. Archived from the original on 15 February 2015. Retrieved 28 September 2013. ^ a b Wade, Mark. "Buran". Encyclopedia Astronautics. Archived from the original on 20 December 2008. Retrieved 20 December 2017. ^ "S.P.Korolev Rocket and Space Corporation Energia held a ceremony..." Energia.ru. 14 November 2008. Retrieved 3 September 2016. ^ Handwerk, Brian (12 April 2016). "The Forgotten Soviet Space Shuttle Could Fly Itself". National Geographic Society. Retrieved 12 April 2016. ^ "Buran: 1st Flight". Buran-Energia.com. Retrieved 20 March 2017. ^ a b Chertok, Boris (2005). Siddiqi, Asif A. (ed.). Raketi i lyudi [Rockets and People] (PDF). History Series. NASA. p. 179. ^ a b "Russia starts ambitious super-heavy space rocket project". Space Daily. 19 November 2013. Retrieved 13 December 2013. ^ "Largest spacecraft to orbit and land unmanned". Guinness World Records. Retrieved 10 March 2017. ^ "Экипажи "Бурана" Несбывшиеся планы". Buran.ru (in Russian). Retrieved 5 August 2006. ^ Whitehouse, David (13 May 2002). "Russia's space dreams abandoned". BBC News. Retrieved 14 November 2007. Hendrickx, Bart; Vis, Bert (2007). Energiya-Buran: The Soviet Space Shuttle. Springer-Praxis. p. 526. Bibcode:2007ebss.book.....H. ISBN 978-0-387-69848-9. Elser, Heinz; Elser-Haft, Margrit; Lukashevich, Vladim (2008). History and Transportation of the Russian Space Shuttle OK-GLI to the Technik Museum Speyer. Technik Museum Speyer. ISBN 978-3-9809437-7-2. Wikimedia Commons has media related to Buran (spacecraft). This page was last edited on 19 March 2019, at 23:01 (UTC).